Adding a few extra accessories and colors to an entry doesn't have to be expensive, but it should give your visitors an idea of your design style and may even make them curious and excited to view the rest of your house. I love the entry shown above because it combines function with aesthetics. 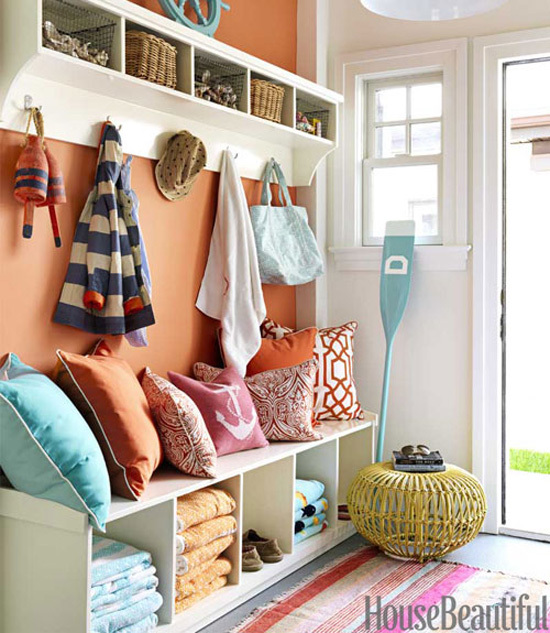 It provides a space to store the needed daily accessories (like jackets and shoes) and yet the design and colors make the space pleasing and fun to look at. My entry way could definitely use some help, but then again I'm not sure there is much I can do since the front door opens straight into the living room and gives a clear shot into the open dining area and part of the kitchen! and now, I'm curious to know...What does your entry way look like? I love when homes have a welcoming and gorgeous entryway! Right now ours is pretty non-existent because it opens right up into the house, but once we buy a house I would love to have a statement foyer! Well... It's FULL! Too full! Though very small. More of a storage area really, no, not good, not good... all due to lack of space in the house though, so there's nothing we can do about it for now.